We're officially a campaign now. We start December 1, 2016 and run until September 1, 2017. Now its time to get our Landships and other multi-headed monsters ready for construction. I can hardly wait! I still have a lot of research to do into a paint scheme for my M60A1 (Or atleast into the one I want to try in the guide. No year is given...), and a few kits before then to pass the time. Please don't sweat the edits/deletes, we're pretty informal here. Just stow it away in the back of the head for next time. What M60 kit do you have in mind? I have a couple of the Dragon M48s but haven't built one yet. I did build their M-46 as a Marine in Korea. It came out pretty well. No second turret though . . . I just ordered another Meng Char 2C. I have one of these already that was squirreled away waiting for an AM kit to backdate it to its original 1921 fit. I haven't checked recently, maybe somebody has one out? In any case I just ordered another kit to build it in its 1939/1940 condition. One of the marking options was very dark with a skull & crossbones, very appropriate for their lamentable fates. These were supposed to be the largest tanks ever built, a true Landship. Looking forward to seeing it! This bruiser had a 12 man crew and crawled at little better than a walking pace. It was massively armed and armored for its time. Only 10 were built and one MIGHT have been taken buy the victorious Soviets from Berlin to Russia. Is so, it seems to have disappeared. It would have to be a pretty big hidey-hole as the Char 2 was not a small bauble. Fair enough on that, I'm used to gaming forums where forgetting stuff like that in the edits typically leads to having to deal with either a few pages of nonstop "corrections", or insults. Sometimes I forget that's not the entire internet! Old habits die hard though, I suppose, lol. But, the M60A1 I intend to build is the AFV Club version, just picked it up on Saturday, and it looks great! It has a few extras I already appreciate; Metal barrel, driver's interior, seemingly workable suspension, etc. The only issues I have so far are that it only includes early tracks, lack of dates on marking options, and the slightly fragile looking vinyl tracks (The last pinned link is only held on by the guide tooth), but that's nothing too severe. Looks to be a relatively easy build, though I'll have to research a bit into the marking option I like. How are those Dragon M48s though? I've been really tempted to pick up an 'A1 myself. It's starting to seem like most of the US markings in the AFV Club kit are for vehicles that are a good bit newer than the OOB kit would have you assume. I might end up not worrying too much about it and just use the kit's decals, but I'm really not sure. Oh well, I'll figure it out eventually. Probably going to start a post later to see if anyone on the forums can identify if the markings I intended are 'correct', or perhaps find a decent scheme for an early M60A1. As I'd rather avoid replacing the tracks! I really haven't seen any flame wars or trolls on Armorama. My own build skills are modest and the comments have always been encouraging & helpful. I can only hope that it will always stay that way. I have read that the Dragon M48s have some issues. They look great in the box and I will not fear to build one when we get a good Viet Nam or Cold War campaign running. I have built the Dragon M46 Patton. It builds well and looks great to my eyes. I'm sure no expert so that is far from any sort of endorsement of authenticity. I got a set of AM decals to build a Korean War Marine tank and itt looks the part. I particularly like the DS tracks. These need to have the horns glued on which is tedious but the tracks look great and look like they do in the photos - live tracks with little or no sag. I look forward to seeing your M60 progress! Thanks, I think I've only even seen one incident anywhere close to what I'm used to, on this site, even then it was pretty one-sided and the post went back to a positive topic within a day, So I'm not too worried about seeing all that, it just messed up my tendency to bother with forums, so far I've had nothing but good luck here though! Fair enough though, good to know there's nothing hilariously bad on them (Wasnt really expecting that, but still, always good to know), I'd probably have gotten one this month, but I'm currently waiting to get a Miniart T-44 and SU-85, and add the M60A1 and AMX-13/90 I bought this week, and well... I have to keep my buying in-check for a while, lol. Could be worse on the tracks though, I've got a couple kits with separate guide teeth to put up with soon (One has DS track, other's indi-link. ), so... Certainly going to be ready by the time I get one! I didnt even know there was an M46 kit though, to be completely honest, I must assume it's an older kit, but good to know it went well! DS track overall is hit-and-miss to me, it's be great for anything without sag, and anything with sideskirts, but I still remember trying to figure out the ones on my Ha-Go, which were MUCH too long... Worst part is, it was the first tracked model I built. I've only been using indi-link / link-and-length since, so my M60A1 is going to (hopefully) be a nice change! Not having any luck finding a suitable paint scheme though, but I DID find one picture of an M60A1 with T97e2 tracks, so... It IS possible! To 'update' my last post, kinda. It turns out the kit markings are alot more usable than I assumed in my hasty attempt at researching into it, my intended scheme is fine. Google was just being really awfull at finding results for 'T97E2 tracks', all it gave me was an endless amount of sites to buy AM track. But it turns out they were in service longer than I guessed by the pictures I found (All octagonal track M60A1s), so, luckily, I'll have no problem starting my build on the campaign date!... Well, I would have anyway, the painting/marking stage would have just been hilariously slow. Point stands though. Short version? Google = frustrating. Edit so I dont double post again: It'd certainly be interesting to see that French superheavy built for this campaign, I always forget about that hilariously massive thing! Edit: I'll personally bake a cake to whoever build (and finish) it in 1/35. Wow, now that is a landship. From the side it looks like the guns on a Battleship. Nicolás - That is indeed a great Landship. When was it being designed? BTW, 1/72 scale kits are welcomed here. Anyone care to try this wonderful whiffer? I see we have a number of new campaigners who enlisted over the weekend and we are now good to go having passed the minimum compliment of Landship builders. Welcome aboard everyone. This is gunna be fun! I started the suspension on my Tamiya Lee because I needed to grind the mounts off the hull to use a replacement suspension. Can I still use it for the campaign? If not I have an M48A2 and a M60A1 I could do. "The only thing a man should take seriously is the fact that nothing should be taken seriously." Sure, this is a minor start, really destruction rather than construction. We have 9 months or so after the official start to work on our models so we have plenty of time to get'er done. We can even change our minds about what we want to build or build more than one . . . I'm working on the Trumpeter KV-5 kit for the Tank Hunters Campaign. It would fit right in here so I thought I'd post the pictures just for fun. The Landship Campaign will not start until December 1 so this is not an entry here. This is my first try at assembling link & length tracks without a jig. I used the masking tape and Testors liquid/gel glue method. It worked well but for the fact that the glue stayed puddled in the joint between the links. I had expected it would wick in somewhat and not mar the surface. I will try it again but using the glue more sparingly. I usually build Fruil metal tracks but this monster would have needed two sets. Looking very good Paul, yes, that's a lot of links! I just found a resin tail kit for the Char 2 - Niko Model - Nr. NP35001. What else is required to backdate the Meng kit to its original 1921 fit? I see there is a paint mask kit for this model also. Has anyone used these? Are they easy to use? Hello all, I just want to make sure my intended build falls within the parameters of this campaign. I have a 1/35 Trumpeter E-100 that I will modify with the small MG turret found in the Trumpeter E-25 kit. That sounds like a perfect wiffer to me for this campaign. It even has the require "whiff" of reality. I'm building the E25 for the Tank Hunters Campaign and found the MG turret to be really small for use. A Panzer 1 turret would be more practically sized. 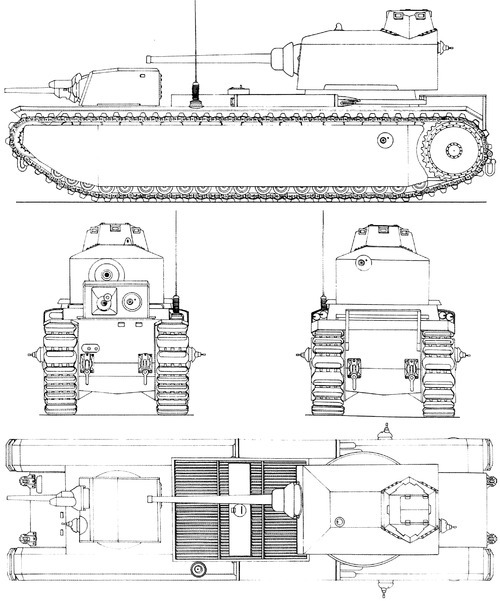 Another option would be the turret from a Panzer 2....it would also give it some AA capability. I was looking over the Hobby Boss French Saint-Chamond Heavy Tank from the First World War last night. What a Landship this one is! It has a long casemate like an old Confederate iron clad with machine guns pointing out at odd locations and a 75mm field gun bolted in the bow. The oddest part of the whole thing is the very short undercarriage and tracks leaving huge overhang fore & aft. The designers added skids and even rollers to ease the ground contact that must have happened often. The kit looks great and should be fun to build. You will not see one of these built too often! I'm not going to lie, that tank has always looked pretty absurd to me! I can normally respect a design even if it didnt get with the times... But that thing, lol... So strange and inconvenient looking. The French really went crazy with those landships though, FCM F1, Char 2C, St Chamond... Honestly, I'm amazed the FT-17 looked "normal"! Still though, everyone has their preferences, I dont doubt it could look nice. By the way, nice KV-5 build! I was looking at the Takom one myself, only havent bothered due to "KV-burnout". Out of curiosity though, would a Char B1 be valid for the campaign? Sortof a landship-light IMO. I'm probably sticking with my plan of an M60 (Either A1, or A3 when its released...), but still, might give me an excuse to finally buy a B1!